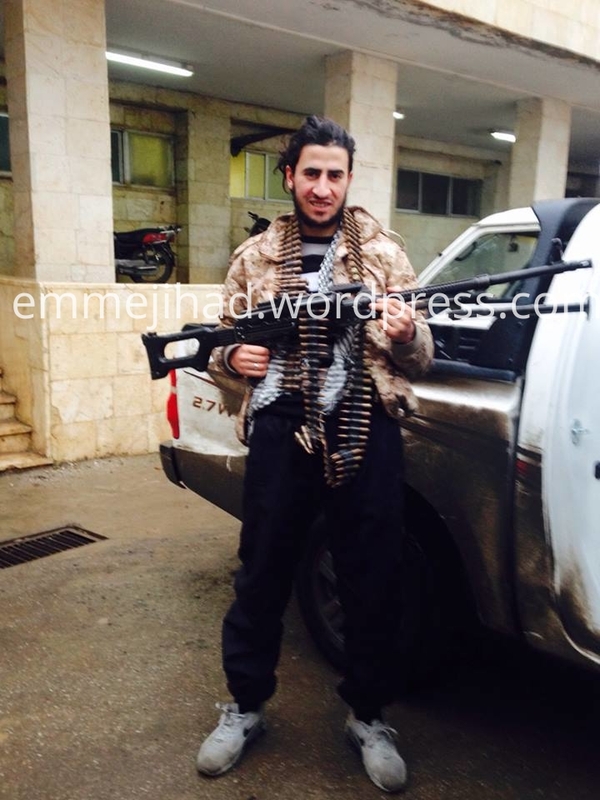 Recently, a new Belgian fighter has surfaced within the ranks of the Islamic State (IS). The fourth already from Maaseik. The radical islamist community in that little border town is bridging the gap between the actual networks and old school terrorists — a rather rare phenomenon in Belgium. He posted his picture a few days ago on his Facebook account, the Belgian fighter who’s using the alias ‘Abou Shaheed’. Standing beside the seemingly obligate pick-up truck and holding an impressive rifle. Little is told about the location, the date of his arrival and his true identity. But apparently he went to Syria somewhere last month, his friends at home are calling him ‘Fasil from Maaseik’ and his actual Facebook account previously has carried the name of Fayssal Oussaih. The name Oussaih rings a bell for anyone familiar with the extremist scene of Maaseik. Back in 2006, several inhabitants of the town were convicted at a trial in Brussels for their membership of the ‘Groupe Islamique Combattant Marocain’ (GICM), a terrorist organization held responsible for the bloody attacks of Casablanca (45 deaths at May 16, 2003) and Madrid (191 deaths at March 11, 2004). Later, it became a part of ‘Al Qaeda in the Islamic Maghreb’ (AQIM), the North African branch of Osama bin Laden’s network. More on its background can be read here. One of the defendants was tried in absentia because he was imprisoned in Syria already. At that time, the country was known as main gate to the jihad against the US military presence in Iraq. Apparently, GICM was active in the recruitment of fighters for that struggle, and Khalid Oussaih — a man from Maaseik who was in his early twenties then — had lent his passport to a higher ranking GICM member in order to let the latter escape during one of their travels. While he was sentenced to four years in jail by the Belgian court, Syria responded to an extradition request of Morocco, leading to another sentence of three years there. After being freed in Morocco, Khalid Oussaih spent some time in France. But in 2013, he decided to settle again in Maaseik. In November of that year, he was arrested in Belgium because he never had served his prison time here. But he appealed against the initial verdict — a case that is lingering on — and in the meantime, he’s free. The exact relation between Khalid and Fayssal Oussaih isn’t clear yet, but since they share their name and their rather tiny hometown, chances are high that they are relatives. Fact is that Fayssal Oussaih has connections with at least two other convicts of the trial in 2006. On Facebook, he is friends with Khalid Bouloudo and Abdallah Ouabour — who were both sentenced to five years in jail for being members of GICM. The same is true for Jamal Elkoua, one of the other fighters in Syria with roots in Maaseik. And a third one, Rachid Iba, was convicted himself to three years in jail back in 2006. So in Maaseik, there exists some kind of continuity between the ‘old school’ terrorists of GICM and the current networks recruiting for IS. That is quite exceptional in the Belgian context. The country has seen a very wide range of islamic extremism in the past decades, but nowadays everything seems to be centered around completely new organizations — of which Shariah4Belgium certainly has been the most important one. Interestingly, there is a connection between the fighters from Maaseik and Shariah4Belgium too — since Rachid Iba has married the sister of Brahim El Mimouni, an important lieutenant of Shariah4Belgium founder Fouad Belkacem. El Mimouni was the webmaster of the organization until he left for Syria himself. Nowadays he seems to serve IS both in its propaganda department and in its foreign relations — more specifically by strengthening the ties between Syrian an Libyan cells. Apparently, El Mimouni grew that important that comrades now are calling him ‘sheikh’. Finally, we’ve mentioned already another figure with roots in the ‘old school’ Belgian jihad, who currently is forging ties with the new generation of extremists. In April of last year, Abdelkader Hakimi posted pictures taken in Aleppo on his Facebook account — an apparent sign of being in Syria — while he too had friends already within the regiment of Belgian fighters recruited by Shariah4Belgium. Hakimi was considered as the European leader of GICM and sentenced to eight years in prison at the trial in 2006. All those links may be results of merely personal acquaintances and coincidence, but it would be interesting to know whether there are similar patterns in other European countries too. We are very keen to learn about connections between the actual jihad in Syria and Iraq — not only IS — and former operatives of GICM.